I first saw Bon Iver play in August of 2008. I went with a friend who happened to be visiting Los Angeles the same time I was there visiting some friends on my way back to Hawaii after a little mainland visit. The show was great for several reasons. They played at my favorite venue (The Troubadour. It happened to be my go to venue in my high school days) which you have to drive by the Los Angeles Temple on Santa Monica Boulevard on you way to get there (it's always nice to pass that building), A.A. Bondy happened to open for them, it was great to just be in Southern California again, and to top it all off at that time I was pretty stoked on the gal I was with. I had wanted to see Bon Iver play for about six months before it all came together that late summer day so it was great I was able to work it into the itinerary of my trip. The fact that Justin Vernon got together with a boat load of his friends to create his latest record which comes out in June makes me even more excited for its release. All his collaborations since "For Emma, Forever Ago" have been top notch. As I mentioned in my last Bon Iver post, the fact there is a song called Calgary is pretty neat but all of a sudden it's his first single... so that's rad. Calgarians have to be pretty stoked on that. Hopefully I'll get to see them play live soon. I hear he is bringing all his collaborators from the record on tour with him to better duplicate the sound. Go here for some preorder jazz. I know I sound sorta like a super-fan and that's okay because I really enjoy this music. When I came across it for the first time it was a breath of fresh air. I know a lot of other people have had that same experience. If somehow you are not familiar with Bon Iver I suggest you get on it and delve into the music. It has never gotten old. It's been really neat to see Justin Vernon's career take off over the past couple years. The guy is going to be known as one of the great songwriters of our time. No joke. Picture credit can be found by clicking on the pictures. 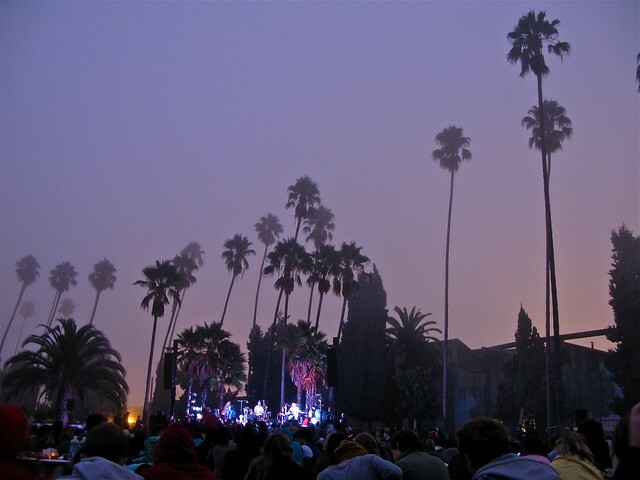 The second pic is of the sunrise concert he played at the Hollywood Forever Cemetery a couple years back. I would have loved to have gone to that show. I heard it was unreal. yes i am a calgarian who is pretty stoked! he better come here on tour if he is going to name a song after this city!